My parents and I meeting my headmaster. Batik school uniforms FTW! 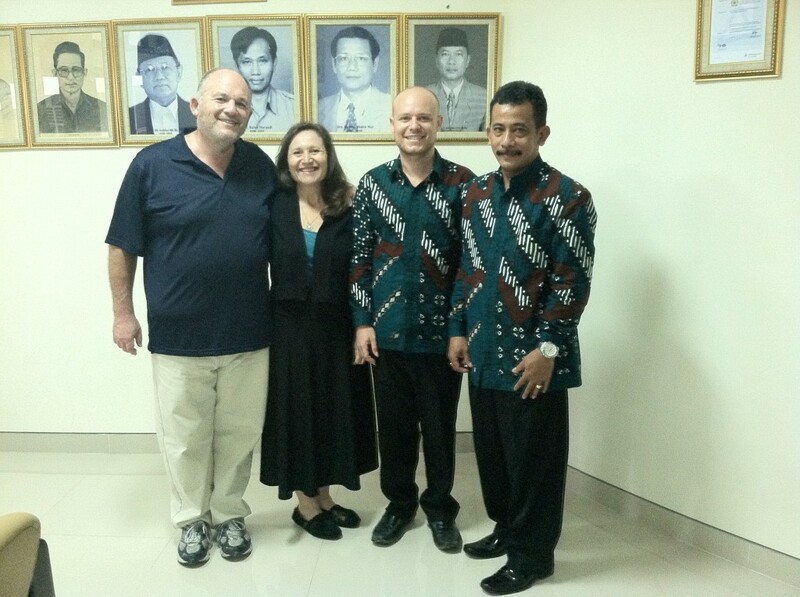 For my quarter-century celebration my family came to visit me in Indonesia. 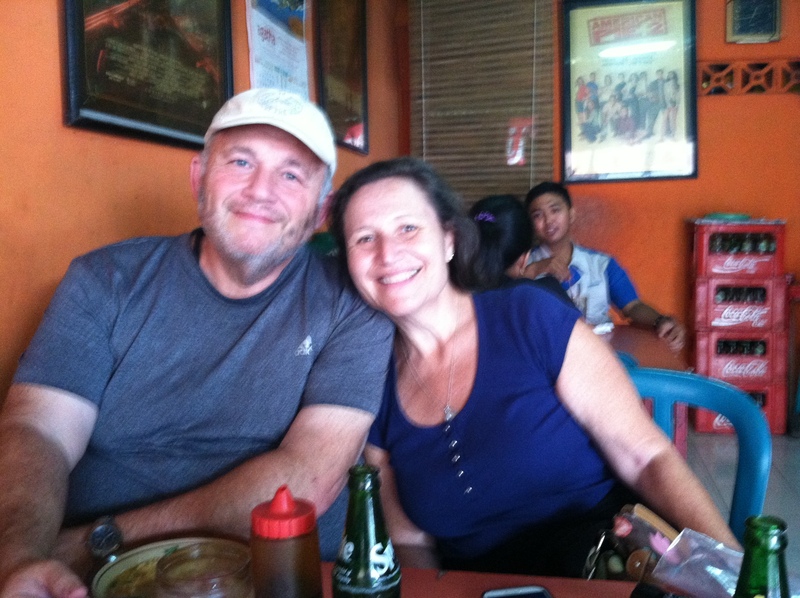 My parents came first to live for two days in the asrama (dormitory), my aunt and cousin from South Africa met us in Bali, where my brother Max showed up as well. Showing my family the life I lead was a surprisingly pleasant experience. Each had their own difficulty adapting to life here for just a few days. I found the things they found difficult or annoying interesting lenses to view how I have changed as a result. Each of their first comments sounded something like, “Is it going to be this hot the whole time?” Expected. It is hot here. What I found interesting is that after being here for 6 months I no longer notice the heat. It’s not oppressive and smothering like Miami, or blistering like a Nashville summer, but it is constant. All hours of the day it is hot, there is not reprieve. My beautifully wise, supportive, and mindful parents at my usual lunch spot. One of my father’s most impressive characteristics is his calm and unshakable approach. Emotions don’t limit his ability to approach ambiguous or difficult situations in a rational and precise manner. I rarely see him so flustered as when he was trying to connect to the internet where I live. He has heard the stories about how it took me over 3 months to even get it installed, and my issues with connectivity. He was adamant that I need to get it seen to by the company. Admittedly, he is a systems analyst who uses computers and the internet every day, and the connectivity issues are abusively aggravating. This is something I have gotten used to. My advice, “Try again in an hour. Maybe it will work then.” Who am I and what have I done with the hyper-efficient TFA corps member I used to be? 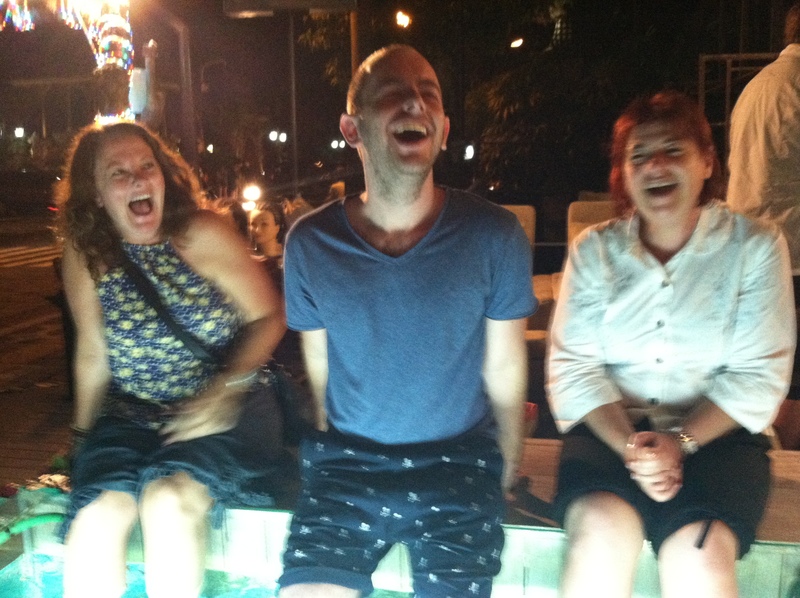 Adam (center) and my aunt Lesley (right) getting their feet munched by tiny fish. Seeing my cousin, Adam, and my aunt Lesley again for the first time in about five years was fantastic. Growing up with most of our family halfway across the world was difficult. We never went to grandma’s house after school, or had whole family dinners to celebrate holidays or birthdays. We were very fortunate to see each other every few years, and cherished those moments. We still do. I always have mild butterflies before seeing my abroad family. I’m always a little worried that they won’t like me anymore, that I or they have changed somehow. Maybe I’m fortunate that my family is great at picking up where we left off. I wouldn’t know; I’ve only got one. Maybe it is part of the human condition – our ability to find common ground with anyone that we care enough about to try. 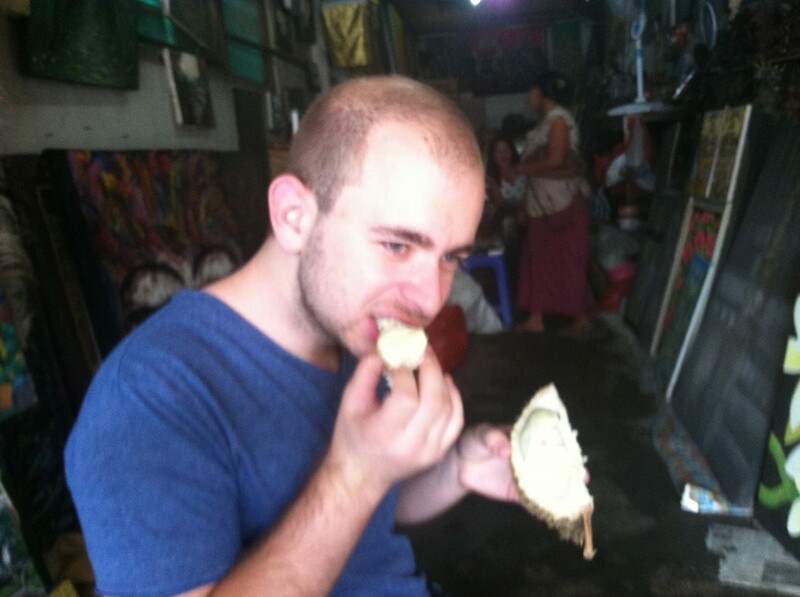 Adam trying durian for the first time. Max and I really hit it off during this trip. Being eight years apart meant that for most of my teens and early twenties he was still a little kid. In the last few years we’ve really started to become brothers. Our interests are starting to align and our conversations meaningful. He loves to travel too so I’ve got a lifelong adventure co-pilot. The mushy but obligatory family points aside, I noticed a few other things about myself during their trip. My English language skills are dwindling rapidly. My Indonesian language skills are quite impressive. In my everyday life I am by far the worst, which can be demoralizing and uninspiring. Being around others who knew nothing, like me when I first got here, made me proud of my conversational fluency. Durian has really grown on me. I shared a similar reaction my first time eating it, but now, I look forward to it. Being swarmed by motorcycles doesn’t bother me, and neither does the chaos of the road. The clock has much less control over my life. Things happen here when they happen, and I’m used to that. Eating isn’t a meal without rice! I have invited my mom to write a piece about their trip from her perspective. I’m excited to see the things she highlights and share them. Hi Jared, Apa kabar? saya sitorus dari Trans Hotel bandung. Masih ingat saya? Anyway, i had read it your posting and i found your Indonesia Leangue getting very well. Wow bagus sekali. Have a great day dan selamat Pagi Bro…. Hi Sitorus, senang sekali. Tentu saja saya ingat Anda. Bagaimana kabar Anda? Kapan datang ke Jogja bertemu kami di sini? Selamat pagi Bro!